Klaus Heymann's Naxos Records stands as a prodigy in both quantity and quality. The present box marks the label's thirtieth anniversary; it finds an earlier echo in a celebratory 30-CD set from Chandos in 2009. The Naxos history has many twists and turns but its stunning trajectory has always been onwards, upward, outwards. Much of the detail of that story can be found in Nicolas Soames' book The Story of Naxos (2012). For some years shunned by the grander review 'voices' and retail media I recall that, in the label's early days, I could only find Naxos CDs in Woolworths. Naxos had the effrontery to compete with the doyen labels usually peddling new recordings at full price. They made accessible the core classical repertoire but also plunged into terra incognita and all at bargain price. These discs were often recorded afresh in Slovakia and Hungary with then little-known musicians from those countries. I should also just note their Historical series and the label's toe-dipping forays into different media including DVD-A. The sheaf of thirty discs that confront us here is quite a swathe although it's a small feather when it comes to a label that sports some 9000 titles. The price (circa £22-25) is bound to attract although collectors may well have to face some duplication. As a sampling it ranges far and wide through the Naxos catalogue. The box forces you to forego full liner-notes. If you want those then you can find them if you search each disc on the Naxos site and click on 'About this recording'. The booklet with the box gives track and discographical details plus a headline narration and compact reminiscence for each disc from Mr Heymann. There's also a quote or accolade from various reviews: five from MusicWeb International. Inside the cap-box each CD is housed in a card sleeve reproducing the cover of each disc. The back of each sleeve is plain - music and artist details, tracks and timings are in the booklet. Given the playing time of thirty CDs and their history over thirty years this write-up is based on previous MWI reviews and some very selective sampled listening; I have not listened to every disc or every track of every disc. That said, listening to and considering these discs I have been reminded, time after time, of the delights on offer even within the confines of this set and this is only an infinitesimal proportion of the music-making that Naxos has presented to the world. The range addressed is wide and hard choices have been made at all levels. The discs are arranged, as close as possible, to alphabetical by composer. 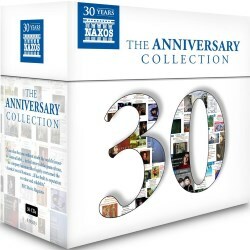 Naxos sometimes have three or four recordings of the same works in their possession. Take for example the Sibelius symphonies (Leaper, Sakari, Inkinen) although he is a composer whose symphonies do not put in an appearance here. Capella Istropolitana's 'early doors' disc of the four orchestral suites by Bach has been set to one side in favour of Helmut Müller-Brühl and the Cologne Chamber Orchestra. They treat us to suites splendid in ardour, both gay (Badinerie, Suite No. 2) and grand (Ouverture, Suite No. 4). Their style favours lean romance rather than period strictures. The flautist Karl Kaiser in Badinerie is driven - and drives at perilous velocity. Jandó's three Beethoven sonatas, dry-eyed yet empathetic, remind us of the very earliest days. Jandó is heard here in Budapest in 1987. This pianist recorded a staggering amount of music for the label and always with communicative integrity. His full Beethoven cycle is still in the Naxos catalogue. Another radio station collaboration - this time with Radio Bremen - brings us up to date with Gabriel Schwabe's often intense take on Brahms' Cello Sonatas. They are joined, unusually, by half a dozen nicely brought off transcriptions of Brahms' lieder. These were made by Schwabe and his pianist Nicholas Rimmer. Tintner's complete Bruckner symphony cycle (still a central plank of the Naxos catalogue) is represented by a weighty reading of the Fifth Symphony. The wide dynamic range achieved by engineer Michael Ponder with the RSNO - the cycle was accomplished using a mix of orchestras also including the New Zealand SO and the National SO of Ireland - is remarkable. The sound and Tintner's approach reflects honest to goodness integrity with no attempts at hype or personality. The disc is remarkable for dicing with silence. The romantic relaxation of the finale is memorable. The Chopin Piano Concertos are heard in the stylishly understated hands of another great Naxos name - Idil Biret. Over seven days she recorded these two works in the opulent acoustic of the House of Arts in Košice in 1990. Martin Sauer - a family name much associated with the Dartington Quartet - handles the engineering. Biret Naxos CDs abound and there's a 14-CD Biret Edition as well. Leonard Slatkin blows away the cobwebs with this Copland disc alongside the Detroit Symphony. He favours weight, impact and sly humour rather than a surfeit of brash glare. It's an excellent disc that mixes exuberant Copland of the 1940s with one late score, Dance Panels. There are thirteen tracks on the CD although the tracklist claims 14. Nothing appears to be missing so perhaps two tracks were combined into one somewhere in the running order. Daugherty's Metropolis Symphony is a burly phantasmagoric romp of a symphony. It emerges from the epic American high plains of Roy Harris and outdoor Copland yet strides with confidence amid high culture, popular music and classic film scores. It’s a volatile brew transcending any fears of comic-book trivia. Deus ex Machina is a three-movement piano concerto - celebrating those smoke-belching dreadnoughts of the railways in Daugherty’s jazzy-bluesy kaleidoscopic and brakeless careering hayride. Both works are played to the hilt and the recording – especially in the case of the symphony - is the modern equivalent of Decca’s best analogue vintage. Peter Breiner is a frequent collaborator with Naxos and his inventive orchestrations of the Debussy Preludes added to his standing. He studied with composer Alexander Moyzes in Bratislava and has written two symphonies - let's hear them. His Beatles à la baroque and Elvis arrangements made him a steady earner for the label. It takes some steel to square up to orchestration of Mussorgsky, Janáček and Tchaikovsky but Breiner lacks neither valour nor artistic accomplishment. He is a stylish practitioner and here favours more romantic textures than Colin Matthews in his orchestrations heard on the Hallé label. It’s good to be able to luxuriate in both sets. There's much to enjoy here. The Dvořák Piano Trios are imperiously spun by The Tempest Trio and they are certainly recorded with an eager front-facing confidence although not everyone agrees. While on the subject of Dvořák we have Marin Alsop's sonorously urgent - driven even - New World from Baltimore. This CD also lets us hear a perkily ardent Symphonic Variations; it’s a shame that the latter is in a single track. CD11 skips back in time to November 1991 and presents Maria Kliegel - another Naxos star who has contributed to and led many discs in its catalogue. Here she is in the Dvořák and Elgar concertos. Murray Khouri working in November 1991 makes London's Henry Wood Hall sound glorious. The stalking finale of the Dvořák strides out huskily magnificent. A close and immediate balance finds Kliegel and the RPO in excellent form in both works. James Judd's Vaughan Williams, Lilburn, Alwyn, Bridge, Antill, Cresswell, Sculthorpe, Copland, Zemlinsky, Bax and Bernstein, almost all with the New Zealand SO, make distinctive contributions. On CD 12 he gives us some rippling Elgar marches. It's a disc packed to capacity and full of character. Only Chandos offer Pomp and Circumstance No. 6 (courtesy of Anthony Payne); Judd gives us the usual canon of five. These are good but not up to Norman Del Mar's cracking standard set with the RPO (Polydor, DG) all those years back with Brian Couzens at the desk. I mentioned Leonard Slatkin earlier and he has some very flavourful Rachmaninov discs in the Naxos fold as has Gerard Schwarz and his Seattle Orchestra when it comes to Borodin and Rimsky-Korsakov. JoAnn Falletta's Griffes made for a very strong presence but this blockbuster stereo spectacular Gliere Ilya Muramets Third Symphony - epic and vividly coloured stuff - also did very well. It demands and rightly receives its place. Credit to Naxos for its sustained connection with the Buffalo Phil - first revealed years ago as wonderfully adept in their Gershwin with MTT. I see they have just issued some very promising Karlowicz (8.573683). The Naxos association with Antoni Wit and various Polish orchestras dates far back if not quite as far as Jenö Jandó or Capella Istropolitana. In 1993, a year after Nonesuch had broken the ground with its full price disc of Górecki's Symphony of Sorrowful Songs (Dawn Upshaw), Wit and the Polish NRSO made this CD. They added Three Olden Style Pieces. The Symphony is one of those pieces that suddenly meshed with the spirit of the times - it dates from 1976 so had to wait fifteen years for modern mass popularity to catch up. That popularity has probably waned a little but this surging, emotional, soulfully glowing music continues to draw deep on the emotions. It's true that you do not get the sung words - although you will find them on the Naxos website. In any event the sentiments emerge unalloyed. Soprano Kilanowicz who has recorded Kilar, Szymanowski and other Górecki, projects integrity. On this occasion her soaring bell-like voice takes a deferential step back into the orchestral canvas yet registers nonetheless. The Three Pieces are also in Górecki's accessible style; there was a time (1950s-1970s) when his music buttressed the towering walls of the avant-garde. This disc should encourage some listeners to explore Górecki further and Naxos oblige with two more entries: Symphony 2 and Little Requiem. CD 15 was set down in the mid-2000s as part of a Grieg orchestral project by Naxos and Bjarte Engeset. Gynt's Homecoming is stormily hammered but everything else is in pleasing place throughout the Peer Gynt suites. To these are added 35 minutes of songs with orchestra, several linking back to Gynt. A Handel Water Music disc is as much de rigueur in any label's catalogue as the Bach Suites. This recording stands as representative for another prolific artistic collaboration - with Kevin Mallon and the Canadian Aradia Ensemble. The Kodály Quartet recorded the complete Haydn Quartets for Naxos between 1989 and 1996. The results were well received and still stand high. The Nebolsin disc also evidences the Naxos connection with the RLPO and Vasily Petrenko. Once again Naxos had recorded the Liszt concertos before - twice - with Idil Biret and Joseph Banowetz. Gallois's Mozart flute concertos are well done. A personal highlight next: Nordic Violin Favourites nestles aptly with other CDs in the same line: Scandinavian Festival (8.571098). Scandinavian String Music (8.553106) and Scandinavian Festival (8.550090). As for the soloist here - Henning Kraggerud - he already has quite a few Naxos entries: Sibelius, Ysaÿe, Grieg Sonatas and Sinding. This disc is well worth going to first if you are looking to pick early cherries from this set. Kraggerud's magical Sibelius Humoresques are well up there with those of Aaron Rosand. Russian-born Israeli pianist Boris Giltburg is a fairly recent signing with Naxos - his Shostakovich Piano Concertos did well and these Rachmaninov Études-Tableaux and Moment Musicaux are vividly done. They have been warmly recorded by Andrew Keener and Phil Rowlands at Wyastone Leys in 2015. The Lento assai Étude is done in a breathless tension that contrasts with the purling gallop of the F sharp minor Allegro molto. It’s good also to have the complete Op. 16; the D Flat major Moment Musical sounds so much like Medtner. The Rimsky suites disc is a classic and is not short of Russian flavour; not to forget Schwarz's Scheherazade and his Borodin Symphonies. CD23 has two of the finest guitar concertos alongside the famous Rodrigo. Norbert Kraft lifts the spirits in the vividly ardent Rodrigo; nothing small scale about this. It's rapturously done and neither Kraft nor the Northern Chamber Orchestra directed by Nicholas Ward disappoint. A chamber orchestra can produce undernourished string sound - not here. Listen out for the 'speaking' cello in the first movement. I rather wish we could have had the Ponce Guitar Concerto as well but we can perhaps hope for another disc at some point. The sound leaps out to the listener. Joyous stuff. Opera has played a big role in the Naxos catalogue and here a single disc must suffice as an emissary for many well regarded recordings. These have usually been opportunistically drawn live out of bejewelled seasons of this opera house or that. The present Hungarian Rossini Barber with Will Humburg can be heard in highlight form. The disc runs to nearly 79 minutes, mark you. It is a recording with plenty of whiplash spirit and effervescence. Humburg also has recordings of Trovatore, Bohème and Falstaff to his name. One of the multitude of series Naxos has completed is Sarasate's music for violin and orchestra with Tianwa Yang. Volume 2 stands here as the representative of the four CDs. Quite apart from this soloist's full-on musical virtues the orchestral role is not scouted over; it shows in virile colour. A very enjoyable disc. It’s a nice move that the Carmen Fantasy is in five tracks. Back to Warsaw for a disc of Szymanowski's strikingly sensuous or mysterious works for voices and orchestra. This continues, in Antoni Wit's hands, a Szymanowski line first picked up by Naxos/Marco Polo in the 1980s with Karol Stryja. Thomas Tallis's Spem in Alium is a loved landmark of the first English Renaissance echoed in ecstatic complexity by Bax's Mater Ora Filium in the second Renaissance. For years the Tallis was represented at an accessible price on Classics for Pleasure (LP and then briefly CD) by The Clerkes of Oxenford conducted by David Wulstan. Here, as part of what has turned out to be a continuing connection, the work is tackled with tremendous gravity-defeating airborne emotion by Oxford Camerata conducted by Jeremy Summerly. This is a major disc with nothing of the archive or museum about it. The RLPO's Vasily Petrenko has made an enduring impact in the city of Liverpool. His image has towered high on advertising hoardings in the city - remarkable. He has been with the orchestra since 2004 and Naxos have recorded him there including a complete Shostakovich symphony cycle that has supplanted the one made by Ladislav Slovak in the 1990s. Petrenko's Manfred is strong on warm Tchaikovskian lyricism although for me it is outpointed in searing tension and tumbling rush by Rostropovich and Svetlanov. It's a very good reading and better recorded than either of the alternatives I have mentioned. It also stands tall in having a completely idiomatic Voyevoda - a change from the 'usual suspects'. While we are on the subject of Tchaikovsky the next disc (CD 29) gives us the music for violin and orchestra. Ilya Kaler's reading of the Concerto proclaims caring attention to every phrase without sounding at all stilted and the recording reaches right out to the listener. Three other pieces complete the picture and it is testimony to Kaler and the team's spirit that none of them feels like a makeweight. In fact the little Valse-Scherzo can safely be played as a representative of the freshest of music-making on this disc. Appropriately enough the set ends with a CD that has carried Naxos to the world: Takako Nishizaki's Vivaldi Four Seasons. It dates back to 1987 and also features Capella Istropolitana conducted by Stephen Gunzenhauser. The Naxos website assures us that this disc is the eighth best-selling classical CD of all time with sales exceeding 1,000,000 copies to date. Nishizaki has been an inspired indeed brilliant stalwart and advocate of and for the label - more than 100 Naxos/Marco Polo CDs. The present disc may have a short running time but more than justifies its presence as the last triumphant word in celebrating this label. The recording has full-plush elegance, stately impact, picturesque grandeur and sweet sentiment. This is complemented by one of the world's finest concert halls: the Slovak Philharmonic, Bratislava, Slovakia. The recording bears its age lightly and while the sound might be a little lush for HIP tastes it is a delight. While duplication might be an issue for some collectors those who are drawn to this handsome and well thought through collection need have no fears. The price is certainly not an obstacle. It will have a special draw for beginners in the classical field wanting to push the boat out into unexplored waters.